Pasadena Marble Fireplace is a French style surround. 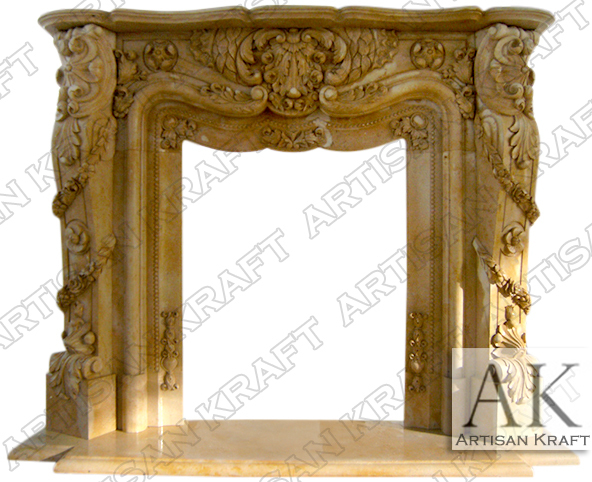 A beautiful historic reproduction French mantel hand carved from solid marble. Lavish floral carvings and leaves. Even the first tray of the inner surround has floral details. The design is reminiscent of the beautiful Greco-Roman style capital building in Pasadena, California an area part of Los Angeles County. Finely carved from real stone. An over the top styled marble mantel with details through out.